गुढी पाडव्याच्या आणि मराठी नववर्षाच्या सर्वांना हार्दिक शुभेच्छा! Every year to celebrate Gudi padwa and Marathi new year, we prepare this Maharashtrian traditional food as a naivedyam / prasadam, and as Gudi padwa is around the corner, I am sharing with you this Gudi padwa particular Shrikhand-Puri Thali recipe. 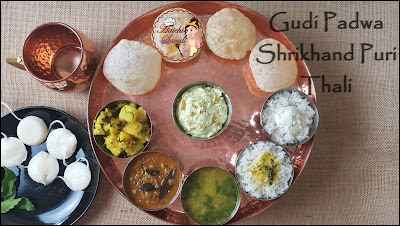 In Maharashtrian families, there is tradition to make this Shrikhand-Poori, Batatyachi Bhaji (Potato stir fry), Bhat-Varan or Puran Poli to celebrate this Gudi padwa festival. Gudi Padava signifies the arrival of spring. (Gudi means flag, erect flag on the houses as part of the celebration in Maharashtra where its mainly celebrated. The word padava is derived from the Sanskrit word pratipada for the first day of each fortnight in a lunar month, i.e. the first day on which the moon appears after the so-called "new moon" day (अमावस्या) and the first day after the full moon. A Gudhi is also hoisted on this occasion giving this festival its name). Gudi Padva marks the beginning of the traditional Marathi new year. It is celebrated in Maharashtra on the first day of Chaitra month(it is also known as Chaitra Shukla pratipada) to mark the beginning of the Marathi new year. Gudi padwa(in Marathi) is also celebrated other parts of India by different names. This day is considered extremely auspicious. And here, all set to celebrate Gudi Padwa. Maharashtrian dish Varan Bhat preparation involving split moong beans or pigeon peas and rice as its main ingredients. This Maharashtrian dal is a vegan, gluten-free recipe and doesn’t require the fancy preparation and lots of spices certain Indian dishes require. In Marathi, varan stands for lentils curry. Bhaat is rice. Firstly rice and split moong dal is cooked in a pressure cooker and then cooked split moong dal tempered with oil cumin and mustard seeds, curry leaves and green chilies. Wash tur dal and add 1 ½ Cup of water. Wash rice and add 1 ½ cup of water and salt ½ Tsp. Turn on instant pot and add 2 cups of water into the pot. Place vent on sealing position. Cook on Manual Mode (Hi) for 6 minutes and NPR for 10 minutes, then release remaining pressure manually. Meanwhile, heat oil in a pan and splutter Cumin-Mustard seeds, Curry leaves. Add green chilies and cook for few seconds and add turmeric, asafoetida and mix well. Now add cooked dal, salt, and water 1 Cup and mix well and cook for 2-3 minutes. Tadaa, healthy and soothing Varan Bhat is ready to serve. It's easy, scrumptious and healthy instant vegetarian recipe. If you are hosting a party at home and don't want to prepare something elaborate and complex, then this should be your go-to recipe. Pair it with puri, potato stir fry, and finely chopped onion-coriander. It is a simple and perfect recipe for breakfast, lunch or dinner, which is easy to digest. Curry leaves add a pleasant aroma to the dish. It is also an instant, easy and healthy side for puri and rice. In a pan add Moth beans, 2 Cups of water and turmeric powder and mix well. Cook for 9-10 minutes or until it cooks well. Meanwhile, heat oil in a pan and splutter Cumin-Mustard seeds and curry leaves. Now, add onion, green, and garlic and saute and cook for 2-3 minutes on medium to low flame. Add tomatoes and cook for a minute. Add red chili powder, asafoetida, cumin-coriander powder, garam masala,, salt, peanuts powder, coriander leaves and mix well. Add 2 cups of water and lemon juice and mix well. Cover and cook for 3-4 minutes. Tadaa, tasty and spicy moth beans green peas curry is ready to serve. Enjoy!!! It is all-purpose stir fry recipe, you can serve this potato stir fry with puri, chapati, dosa, use as a stuffing for potato parathas, Puri, sandwich, rice or you can use it to make vada pav. This is prepared in different variety, today I am sharing the most easiest, quickest and tastiest potato stir fry recipe. Heat oil in a pan and splutter mustard and cumin seeds, curry leaves. Add chopped onion, stir it well and add green chilies, garlic paste, and asafoetida. Saute till the onions, green chilies and garlic darken a bit and add turmeric powder and salt stir it well. Now, add boiled and chopped potatoes, saute all well for 2 to 3 minutes. Tadaa, easy, peasy, all-purpose potato fry is ready to serve, garnish with coriander leaves and serve with poori. Enjoy!!! Shrikhand is a traditional Indian creamy yogurt based dessert, made simply by straining yogurt and sweetening it by adding sugar and flavored with cardamom, some nuts, and saffron. To make blending easy and instant I have used a hand mixer, you can use mixer grinder or wired whisk too. Instead of making it plane shrikhand, I always flavored it with saffron, pistachios, almonds or with mangoes and it tastes heavenly! In a bowl add hung curd or chakka or Greek yogurt (Chakka preparation : Pour yogurt in the middle of the cotton cloth or cheesecloth, pull up four corners of cloth and tie with kitchen twine, allowing yogurt to drain at least 6 hours or up to overnight) and powdered sugar beat or whisk it well. Now add chopped pistachio, saffron strands, and cardamom powder and whisk all well. Beat all together till sugar get dissolved. Tadaa, sweet and flavorsome shrikhand is ready to serve, garnish with dry fruits, it tastes good with Puris. Semolina Poori is a quick, fried Indian puri recipe, a favorite lunch box menu of all the kids. As suji is readily available in all kitchens an easy recipe to try. It tastes awesome when served with shrikhand or potato curry. Puffed up poori it will stay puffed up even if it becomes cold after some time. Semolina gives this poori crispy and fluffy texture. So let's start! In a bowl add Semolina, all-purpose flour, salt, and carom seeds and mix well. Now add water(as needed) and knead to make a soft dough. Apply oil and cover dough with damp cloth and keep aside for 15 minutes. After 15 minutes take some portion of dough and roll to make big circular shape disc. Using a small bowl or cutter cut the small circle or puris. Meanwhile, heat oil in a kadhai and fry puris well from both sides. Tadaa, puffy, soft Puris are ready to serve. Enjoy!! !